Let the wedding of your dreams last forever with the perfect wedding band from online jewelry retailer Apples of Gold. This band of extremely strong titanium makes for a memorable wedding ring with its superior structure and design. The titanium is sure to last a lifetime and boasts a lightweight feel with unmatched strength. 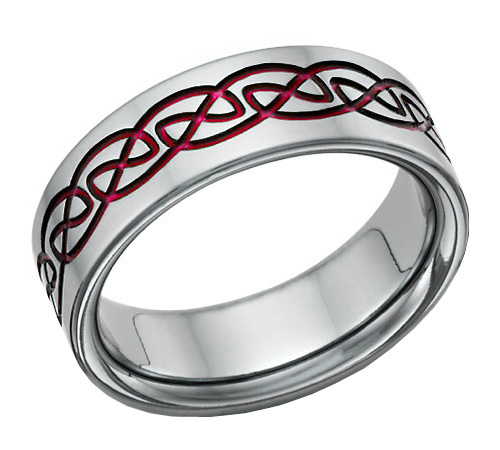 The Celtic knot pattern that weaves over the smooth band is sure to stand out among standard wedding bands because of its rich scarlet color. We guarantee our Red Titanium Celtic Wedding Band Ring to be high quality, authentic jewelry, as described above.